The Internet, according to Seth Godin, has been the most disruptive technology to business. Ever. It has radically changed the way that business gets done, enabled information to be realigned, and removed the information disparity between buyers and sellers. Instead of going to a salesperson for product information, consumers are going to Google and getting the answers more quickly and more accurately. In an era when 57% of the B2B buying process happens before a human salesperson is ever involved, content has become critical to educate prospects, build trust with your leads, and automate some portion of the sales process. Producing and promoting helpful, informative content for your target audience has never been more important. That’s great, but how am I supposed to produce content? Generating value-adding content is tough. It takes a commitment to something that may not produce instant results. But it’s not as tough as many people make it. Why work harder when you can work smarter? Not every blog post, content offer, or social media post needs to be a brand new idea. Instead, leveraging the content you’ve already developed offline, or simply compiling related helpful content can be immensely valuable to your prospects. For example, Industrial Training International began working diligently to improve their online identity in 2009 under the leadership of vice president Zack Parnell. One of their biggest obstacles? Content creation. Having been in business for 25 years, ITI had tons of content produced in the form of articles and newsletters. Instead of starting from scratch, they were able to repurpose all of that content into downloadable content offers and blog posts built around target keywords and aligned around their inbound marketing game plan. The moral of the story: don’t assume that everything has to be new to add value. Instead, focus on leveraging your existing resources to engage your target audience and supercharge your lead pipeline! Want more in-depth, content-driven sales secrets? 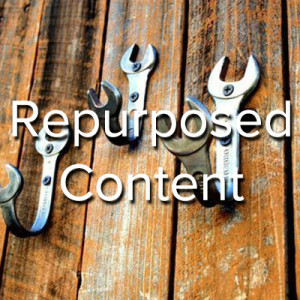 Repurposing content is a great starting point, but there’s a whole lot more that you can do to fill your lead pipeline and drive sales. If you’re serious about growing sales on a budget, check out this free resource with insider sales secrets.